Nicholas Sparks does a wonderful job of bringing the reader into each character's life through the thorough, descriptive style in which he introduces his characters into the storyline. I have spent many hours these past two months being entertained by Nicholas' talented mind and the emotional life's of his characters. Very enjoyable. Easy to get into and follow... not the ending I expected or wanted, but a good book none the less. 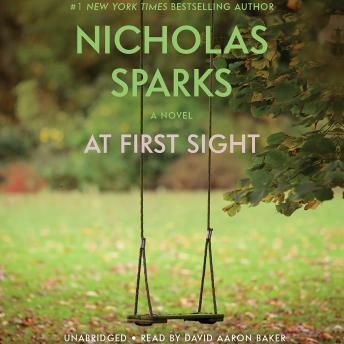 This is the 2nd book by Nicholas sparks that I have listened to, and I think it's official, I just don't care for his stories. I kept waiting for something to actually happen in this story...somthing more than regular life, but it never came. The beginning was so slow I almost gave up. But I love the narrator, David Aaron Baker (from Dean Koontz's Odd Thomas books), and I'm guessing that is why I put it on my list in the first place. Ugh! I couldn't even finish it. I had to keep turning it off and then go back to it. It would just lose me in all the "sap". I agree with the "anonymous" WAY too sappy and really the story went nowhere. There was 7 discs of just babble. I did not connect with any of the characters. As a matter of fact, I really could not stand the Lexie character. Her dying was so predictable that I just decided to stop it there and return it. not as good as other Sparks books, but a good one at that. Sparks is always one to make you stop and think, and look around you before you jump to conclusions. Great book, and if you like sparks, read it!! This starts out to be an easy read book...but it gets more profound as it goes along in the book. He is and excellent writer! This was a big disappointment... anti-climactic and extremely sappy. It was great. I love the characters and the sappy story. I recommend this book.